Paprika is a sweet variety of Capsicum annuum that is most often used as a flavoring for meat, stews, soups and casseroles in Hungarian, Spanish, American and Moroccan cooking. Paprika ranges from sweet and mild to hot depending on where it is grown. Hungarian paprika is considered to have the greatest range of flavor. Paprika is more readily available in powdered form. It is powdery but in many European languages, paprika refers to bell pepper themselves, which vary in colors like yellow, orange, green and red, sizes and shapes. Choosing: In the United States, paprika is defined as a sweet, dried, red powder, which may be made from any type of Capsicum annuum pepper that is non-pungent and has brilliant red color. However, in Hungary, paprika may very well be quite pungent. Sweet Hungarian paprika is considered the best, but others are marketed with varying degrees of heat and color. It is the climate and soil that makes the Hungarian variety of capsicum (also referred to as pimiento) mild and sweet, resulting in the most desirable paprika. The quality of ground paprika also depends on whether or not the seeds and stems are ground in with the dried peppers. Different varieties of capsicum chile pepper will produce from sweet to mild to spicy hot flavor. The peppers can be round, long or square, and may be green, yellow, orange, and/or bright red in color. The Hungarian fruits for paprika are long and thin, as opposed to the smaller, more round ones used to make Spanish paprika. Once harvested, the fruit is completely dried and then ground into the rich, red paprika powder. Paprika should be evenly and finely ground, with a shiny uniform color. The redder the color, the milder the paprika. Conversely, the more yellow the color, the stronger the flavor. Buying: You can buy paprika on your nearest grocery store or your local spice house. Procuring: There are many gardeners that grow their own paprika peppers and grind the pods to make the spices. Some of the recommended breeds to grow are Kolosca and Hungarian peppers. Kolosca is described as sweet with intense aroma. The color is orange-red when ground. Hungarian is mildly sweet with a medium red color. Peppers need warm weather to grow. It is recommended that you sow the seed 6-8 weeks before transplanting in a high quality mix in a shallow starting tray, about 3 seeds to the inch. The potting soil temperature must be kept above 80°F (27°C) if possible to encourage germination. It is recommended to use heating cable or set pots on a water heater. The seedlings will emerge in 7 to 15 days. The plants must be kept continuously moist (but not soggy). After 15 days thin the seedlings enough to give each plant about a 2 by 2 inch area. Also if they become too large transplant them into 5 inch pots so you will not hold back their growth. After germination, move your plants to bright sunlight and keep the soil moist. When transplanting peppers, pick a site that has full sun. Add organic matter to the soil before transplanting. In cooler climates, plant peppers through black plastic and use row covers. Keep the soil evenly moist. Use liquid fertilizer every two weeks. Space the transplants about 18 inches apart with 36 inches between rows. Once established, they are tolerant of drought. 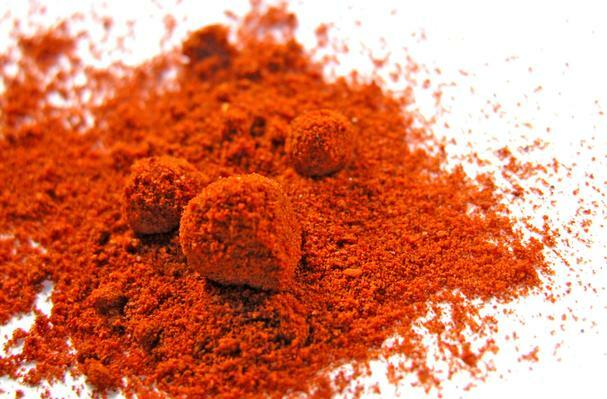 Paprika releases its color and flavor when heated. So when you sprinkle it over colorless dishes it improves the food's appearance not its flavor. This is why it is often used as a garnish, not a flavoring. However you can still use it as a flavoring by stirring the powder into some oil before adding it to a recipe. You can brush the paprika on meats, poultry, or fish. It is important to remember when using paprika in sauces that it has a high sugar content and would therefore burn easily. Add it only when liquid ingredients are present and do not cook it over high heat for too long. The extractive form of paprika is oleoresin prepared from dried, seeds and ground pods. This is used in some sausage products, cheeses, soups, and foods where characteristic paprika flavoring and coloring are desired. Paprika can also be used creatively in cooking . Add 2 tablespoons to your favorite pasta sauce. Sprinkle it on potatoes or homemade fries for a change of seasonings. Use it liberally on poultry ,meat, and fish when cooking. Use paprika as a milder seasoning in chili or stews. It can even liven up some soups with color and flavor. Store paprikas in cool, dark cupboard, away from direct heat or sunlight. Keep the container tightly closed when not in use. Generally, spices and herbs bought in bulk retain their flavor and potency better when stored in containers with tight-fitting lids. Storage time shown is for best quality only — commercially dried spices and herbs do not spoil, but they will lose their potency over time and might not flavor food as intended. Paprika is used as a coloring agent in foods and cosmetics. Its inclusion in foods fed to zoo flamingos help them keep their pink plumage bright and beautiful. History: Christopher Columbus is credited with bringing the chile to Europe. Aristocrats originally cultivated capsicum as ornamental plants until eventually their culinary value was recognized. By the 1560's, these peppers had reached the Balkans where they were called peperke or paparka. The peppers soon migrated to Hungary, now renowned for its paprika. The Szeged and Kalocsa regions of Hungary are the most well-known producers of sweet paprika. The Paprika Museum makes its home in Kalocsa, and the city celebrates its famous spice with the Paprika Festival each year in October. It was not until the mid-1900s that paprika stepped into the limelight of Western kitchens. Spain, South America, Mediterranean regions, India, and California join Hungary as major producers of paprika. The author is very intelligent and he covered all the things which are necessary to explain for here,that's why I learnt a lot of things by his work.The author is very intelligent and he covered all the things which are necessary to explain for here,that's why I learnt a lot of things by his work. This is a really good and informative.I am really thankful to you for this kind information. in this article the author work is very remarkable and i really appriciate of this work.